Recently released research reveals that the suicide rate among middle-aged individuals living in the United States has increased dramatically in the last decade. A report released last week by the Centers for Disease Control and Prevention (CDC) states that from 1999-2010 suicide rates among middle-aged individuals age 35-64 has increased by a whopping 28.4%. These findings are consistent with a previously released study that revealed a significant increase in the overall suicide rate among middle-aged individuals, comparative to a small increase in rates among younger individuals, and a decline among older individuals. The increases reported were geographically extensive, occurring in areas with high suicide rate levels, as well as areas with average and low suicide rate levels. A considerable change in the method of suicide is also noted in the study. 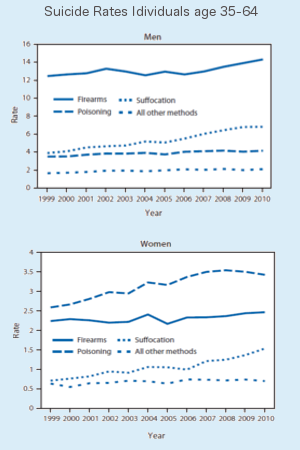 There was a dramatic increase in suicide rates by firearms, poisoning, and suffocation/hanging; with suffocation/hanging suicide rates increasing the most among individuals age 35-64. The study suggests that the recent economic downturn is a possible contributing factor for the increase in suicide rates among middle-aged individuals, noting that historically higher suicide rates have been observed during periods of economic hardship. Although the report does not explicate why exactly suicide rates among middle-aged individuals have increased. It does point out that most suicide prevention efforts have focused on youths and older adults, further highlighting the need and importance of suicide prevention efforts geared towards middle-aged individuals 35-64. The authors describe some of these efforts as focusing on strategies that help middle-aged individuals overcome certain risk factors, such as economic challenges, job loss, health issues, substance abuse, and stress related to partner problems or caregiver responsibilities. In honor of National Mental Health Awareness Month, I am vlogging on behalf of HealthyPlace.com on the topic of self-esteem and how early experiences affect the self-esteem we have today. Many mental health conditions are systemic of low self-esteem (as well as genetic predispositions or life experiences), and according to the APA, 1 in 4 Americans are diagnosed with a mental health condition every year. Mental health effects everyone and learning skills at an early age, to combat negative self-esteem is a proactive way shift these numbers. For more information on how to build your self-esteem or your child’s self-esteem please read my blog on HealthyPlace.com and Neurogistics Blog.